Widely loved and rarely afraid to speak his mind, Bourdain achieved celebrity status after the publication in 2000 of his bestselling "Kitchen Confidential: Adventures in the Culinary Underbelly." The book created a sensation by combining frank details of his life and career with behind-the-scenes observations on the culinary industry. 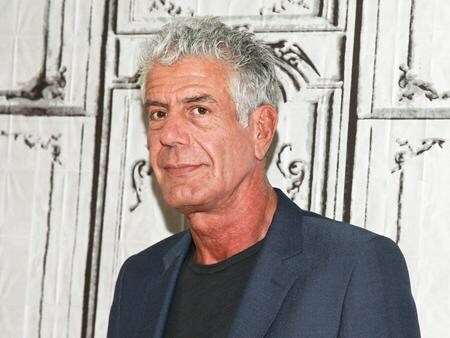 Bourdain's fame rose higher thanks to his CNN series "Parts Unknown." Colleagues, friends and admirers shared their grief Friday. CNN chief executive Jeff Zucker sent a company letter calling Bourdain "an exceptional talent. A storyteller. A gifted writer. A world traveller. An adventurer." President Donald Trump tweeted his "heartfelt condolences" to Bourdain's family, which includes his 11-year-old daughter, Ariane. Jamie Oliver wrote on Instagram that Bourdain "really broke the mould ... he leaves chefs and fans around the world with a massive foodie hole that simply can't be replaced." Chef Yotam Ottolenghi tweeted "Shocking and sad!" while Nigella Lawson tweeted she was "Heartbroken." "Bourdain's exceptional writing made this one formerly picky, fearful eater very brave and want to try everything and I'll always be grateful for him and the worlds he opened," tweeted "Hamilton" playwright Lin-Manuel Miranda. This story corrects that Bourdain's meal with President Barack Obama was in 2016, not 2017 and that he died in Haut-Rhin, not Strasbourg. Sylvie Corbet and Elaine Ganley in Paris, Hillel Italie, Dave Bauder in New York, Shawn Marsh in Trenton, New Jersey, Danica Kirka in London and Pablo Gorondi in Budapest contributed.